AAA Baseball (Triple A Baseball) is the highest level of minor league baseball. Typically, the next step for advancement for triple-A baseball players is a major league baseball team. AAA teams are also used by their affiliate MLB team as rehab assignments for MLB players or as a place for MLB baseball players to continue to work while waiting for a roster spot on their affiliated major league team. The Triple-A Baseball team affiliated with the Arizona Diamondbacks is the Reno Aces. The Reno Aces play in the Pacific Coast League for Minor League Baseball. Their home city is Reno, Nevada. The Reno Aces is the Arizona Diamondbacks top affiliate and is referred to as the D-backs farm team. If you ever want to escape the summer heat in the Phoenix area and see the Reno Aces play, here are some great insider tips you can use to plan a weekend getaway to Reno, Nevada. 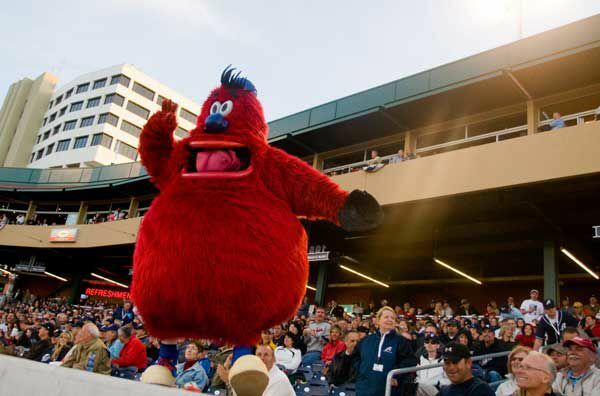 Archie is the official mascot of the Reno Aces. Born in the mountains that surround Reno, Nevada, this elusive creature finally made his presence known in the Aces Stadium once he saw the Aces play. He is 6 feet, 5 inches tall, from the soles of his blue and white sneakers to the top on his Aces baseball cap. Archie is a slender 130 inches around the middle. Archie wears All-Star Flyers. His sleek blue and white sneakers, size 30FF, are guaranteed to make him run faster and jump higher than anyone else out on the field. The Reno Aces current schedule can be seen on the Reno Aces website. You can buy tickets for Reno Aces games in advance online or call 775-334-7000. The Reno Aces home stadium is Greater Nevada Field, 250 Evans Avenue, Reno. The stadium seats 10,000 people. AA Baseball (Double-A Baseball) is the second highest level of minor league baseball. Typically, the next step for advancement for Double-A baseball players is a Triple-A baseball team. Beginning in 2017, the Double-A baseball team affiliated with the Arizona Diamondbacks is the Jackson Generals. The Jackson Generals play in the Southern League for Minor League Baseball. The club's home city is Jackson, Tenn. Some of the players who have played for the team that eventually made it to the big leagues include Nomar Garciaparra, Sammy Sosa, and Carlos Zambrano. Sarge is the Jackson Generals mascot. Sarge is a friendly bulldog that spends his time in the Jackson community after having served his country proudly. The Jackson Generals current schedule can be seen on the Jackson Generals website. You can buy tickets for the games in advance online or call 731-988-5299. Tickets may be purchased at the box office on weekdays and game days. The Jackson Generals home stadium is the Ballpark at Jackson, 4 Fun Place, Jackson, Tenn. The stadium seats 6,000 people. A-Advanced League Baseball is the third level of four levels of minor league baseball. (There are three levels within A-League baseball, those being A Advanced, A and A short season.) Typically, the next step for advancement for A-Advanced League baseball players is a Double-A baseball team. The A-Advanced League baseball team affiliated with the Arizona Diamondbacks is the Visalia Rawhide. They were previously known as the Visalia Oaks. The Visalia Rawhide play in the California League for Minor League Baseball. Their home city is Visalia, California. The name of the Visalia Rawhide mascot is Tipper the Bull. Some of the players who have played for the Visalia Rawhide that eventually made it to the big leagues with the Arizona Diamondbacks include Quinton McCracken, Craig Counsell, Rod Barajas, Eric Byrnes, Justin Upton, Max Scherzer. The Visalia Rawhide current schedule can be seen on the Visalia Rawhide website. You can buy tickets for Visalia Rawhide games in advance online or call 559-732-4433. The gates to Recreation Park usually open one hour before the scheduled game time. The Visalia Rawhide home stadium is Recreation Park. It is located at 300 N. Giddings Street, Visalia, Calif. The stadium seats about 3,200 people and was renovated in 2009. A-League Baseball is the third level of four levels of minor league baseball. (There are three levels within A-League baseball, those being A Advanced, A and A short season.) Typically, the next step for advancement for A-League baseball players is a Double-A baseball team. The A-League baseball team affiliated with the Arizona Diamondbacks is the Kane County Cougars. The Kane County Cougars play in the Midwest League for Minor League Baseball. Their home city is Geneva, Ill. They became an affiliate of the D-backs in 2015. The name of the Kane County Cougars mascot is Ozzie T. Cougar. You might assume that the "T" stands for something feline-like, such as Tom, but no. The "T" stands for "The" making his full name (as his mother would call him if she was angry at him) Ozzie The Cougar! Some of the players who have played for the Kane County Cougars that eventually made it to the big leagues are Miguel Cabrera, Nelson Cruz, Andre Ethier, Adrian Gonzalez, Cliff Pennington, Josh Beckett, A.J. Burnett, Trevor Cahill, Zack Godley, Tyson Ross, Huston Street, Santiago Casilla, Scott Podsednik, Dontrelle Willis, Josh Wilson, Ryan Dempster and Mark Kotsay. The Kane County Cougars current schedule can be seen online. You can buy tickets for games in advance online. Kane County Cougars home stadium is Fifth Third Bank Ballpark. It is located at 34W002 Cherry Lane in Geneva. The stadium seats more than 10,000 people. A-Short Season League Baseball is the third level of four levels of minor league baseball. Short Season teams are typically comprised of first-year players. There are three levels within A-League baseball, those being A Advanced, A and A Short Season. The next step for a player from A Short Season is a "Long A" team. A-Short Season leagues start play in June and end in early September. The great majority of players in the short leagues never make it to Major League Baseball. The A-Short Season League baseball team affiliated with the Arizona Diamondbacks is the Hillsboro Hops, formerly known as the Yakima Bears. They play in the Northwest League for Minor League Baseball. Their home city is Hillsboro, Ore., about 20 miles from Portland. The Hillsboro Hops is a relatively new team; 2013 was the team's first season. Why did they name the baseball team after a grain used to make beer? As it turns out, Hillsboro is the second leading producer of hops in the country. Barley, the mascot, is a grainy sort of character with a goofy smile, wearing a baseball cap! The current schedule can be seen on the Hillsboro Hops website. You can buy tickets for Hillsboro Hops games in advance online in late May, or at the box office.​ Hillsboro Hops play at Ron Tonkin Field, located at the Gordon Faber Recreation Complex. The address is 4460 NW 229th in Hillsboro. The stadium seats about 4,500 people. Rookie League Baseball is the lowest level of four levels of minor league baseball. If a rookie develops at the Rookie League level, the next step is an "A" team. Rookie leagues play a short season that starts in June and ends in early September. The Rookie League baseball team affiliated with the Arizona Diamondbacks is the Missoula Osprey. The Missoula Osprey play in the Pioneer League for Minor League Baseball. Their home city is Missoula, MT. The name of the Missoula Osprey mascot is Ollie Osprey. There is also a real Osprey that lives at the stadium in the outfield in a natural habitat. Some of the players who have played for the Missoula Osprey that eventually made it to the big leagues with the Arizona Diamondbacks include Emilio Bonifacio, Casey Daigle, Miguel Montero, Scott Hairston, Miguel Montero, Dustin Nippert, Lyle Overbay, Gerardo Parra, Jose Valverde, Esmerling Vasquez, Clay Zavada, Jake Lamb, Ender Enciarte, Paul Goldschmidt, Adam Eaton, Andrew Chafin, Socrates Brito, Archie Bradley and Chase Anderson. The Missoula Osprey current schedule can be seen on the Missoula Osprey website. You can buy tickets for Missoula Osprey games in advance online, by calling 406-543-3300 or at the Osprey Office/Team Store located at 140 North Higgins Ave. Missoula Osprey's home stadium is Ogren Park Allegiance Field. It is located at 700 Cregg Lane in Missoula. That's just west of Orange Street next to McCormick Park. The stadium seats about 3,500 people. What Happened to the Tucson Sidewinders? The Tucson Sidewinders used to be the Triple-A affiliate of the D-backs. They played at Tucson Electric Park, which made it quite an easy, short drive up I-10 when one of the Sidewinders got called up to play in the "bigs" at Chase Field! Tucson Sidewinders who played Major League Baseball with the Arizona Diamondbacks include Alex Cintron, Craig Counsell, David Dellucci, Stephen Drew, Erubiel Durazo, Mike Fetters, Luis Gonzalez, Conor Jackson, Randy Johnson, Byung-Hyun Kim, Travis Lee, Carlos Quentin, Reggie Sanders, Curt Schilling, Junior Spivey, Chad Tracy, Matt Williams and Tony Womack.